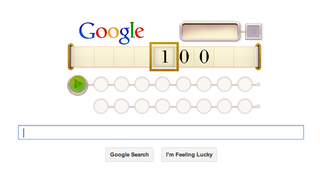 If Alan Turing Were Still Alive today, he would have turned 100 tomorrow. Or if he lived in Australia, he'd be 100 right now. That's why the Aussie iteration of Google is paying tribute to the pioneering computer genius with a Google Doodle that simulates the behavior of a Turning machine. Turing conceived of his famed machine in 1936, which in essence was a mechanical computer with what turing called "infinite memory." His machine would scan the tape, looking for specific cues (in the form of symbols) which would alter the state of the machine. Though capable of processing the logic of any computer algorithm, the Turing Machine is not seen as an actual solution for real-life computing. Rather, it has become a standard way to conceptualize the behavior of CPUs.